blood series uses visual language to generate archetypal, primal figures. there is a subconscious decision to call forth these god figures - form representations. they are tied all together in blood -- birth, life, family, violence and death. from "the garden of eden" to "the hand of god" -- witness horror, joy and recovery. 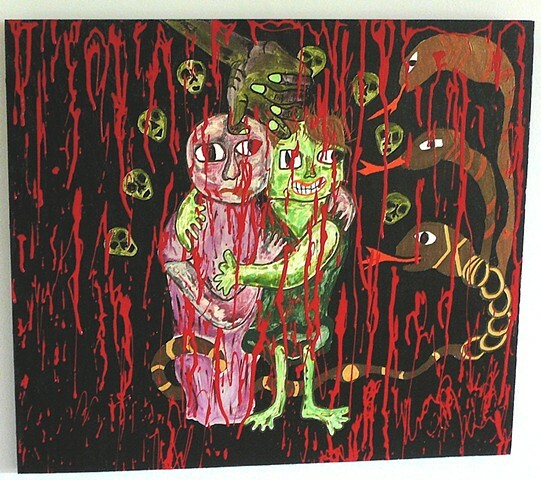 "blood series" was created in a two week painting frenzy following the opening of my art show. there are six paintings in this series. they all were painted in two weeks. Its great Jennifer! The terms 'raw' & 'honest' come to mind when I look at your art. This piece could also be a 'modern-primitive', very appealing to me. Thank you for sharing. Should be in a museum!! Oh Jennifer you~ your art; incredible!!!!!!!! Your work is very strong....i like it!! I like this Jennifer!! Kiss! This is a painting with a powerful, haunting appeal! Touching! "Under the blood rain.." - there is so much positive in this work.. One of my faves. Someone to hold on to, hope in the carnage.. To me, a particularly emotional piece of art. nonostante lo scenario da paura, ci vedo due persone che si sostengono a vicenda, mi piace ! Very sensual and also symbolic image and story of your serie ! Stunning creation ! Years ago I went through a very painful emotional clearing phase...often it felt like you paint it...fantastic image, Jennifer! Heehee Jennifer, it looks like the party has just started or it's over, lol! Very creative artwork and impressive colours and composition too! A fabulous painting! Really a work of art, well done!